With its proven expertise in defence technology and long history of wars, Russia is known for its traditions of weapon manufacturing. RIR presents three of the most advanced weapons systems, which will define the Russian defence industry in the first half of the 21st century. The work on the new aircraft began in CB Sukhoy in 2002. On February 21, 2014 the first machine was supplied to the army for state tests. 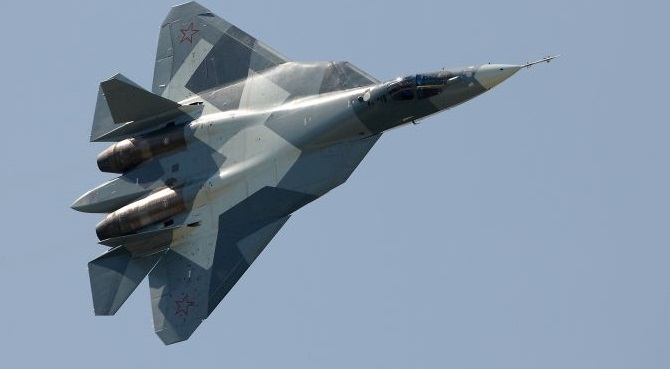 PAK FA is fundamentally different from its predecessor. The new aircraft is a heavy class, but its weight is significantly less than it could be, because its manufacture extensively uses composite materials which make up 25% of the weight of the empty aircraft, and 70% of its surface area. The engine of the aircraft allows it to develop a supersonic speed without afterburner mode, while avionics with radar Belka, equipped with AESA enables the aircraft to simultaneously track 4 ground and 30 air targets and to shell 8 of them. The aircraft itself is hidden from enemy radars due to the absorbing materials of its structure and airframe coating. Even the aircraft's catapult is a new generation one. Its digital computer automatically analyses the speed of the aircraft, its altitude, angles of pitch, roll, angular velocity, pilot's height and weight. At a starting stage alone Russia plans to buy 60 of these aircraft, which will be supplied to the army in 2016. Military action in Chechnya demonstrated that the Soviet tanks, while perfect for mass armies, are not as good in local conflicts. Due to the layout of the T-72/90 the tank's crew is not separated from the ammunition and in case of detonation has no chance for escape. All this was taken into consideration when designing a new machine. T-14 Armata, which will be presented at the victory parade in May, is expected to have incorporated the entire Russian experience in tank design. Armata is still classified and we know little about its performance characteristics, however, according to information leaked to the media, the new MBT will receive a 125 mm gun (with optional 152 mm), the tower will be uninhabited, the gun will be capable of remote recharge, the crew will be lined up inside an armored capsule separated from the compartment with ammunition. Armata will even get its own radar, able to track up to 40 dynamic and up to 25 aerodynamic targets and to control the territory within a radius of 100 km. In 2015, the troops will receive a little over thirty T-14 tanks. Due to its lesser vulnerability, the marine component of the nuclear triad comes as a guarantee of retaliatory nuclear strike and holds back Russian enemies. But the introduction of new strategic bombers into the Russian Navy has been significantly delayed. The main reason behind it was the rejection of the nearly completed solid-fuel 100-tonne missile Bark for which project 955 Borey submarines were customised. Meanwhile, the Navy urgently needed new strategists. Then, in 1998, came the decision to quickly and importantly, cheaply produce marine Bulava on the basis of Topol-M missile. During the first tests, Bulava had many problems, but in recent years the missile finally learnt to fly. Project 955 Borey submarines are capable of making a strike with Bulava from beneath the Arctic ice, where there is no surface navigation, which complicates the detection of submarines not only from the satellites, but also from ships and the interception of missiles in the initial phase of the flight. Moreover, the submarine has become less noisy than its predecessors and learned to shoot on the move from under water. The state programme provides for the release of eight of this type of submarines, three of which are already under construction: Knyaz' Vladimir, Knyaz' Oleg and Knyaz' Suvorov. Probably some of them are being constructed as per the updated project Borey-A. Igor Vil'nit, the head of the CDB Rubin, where the submarines were designed, told the media that it would be Borei will with some extras.